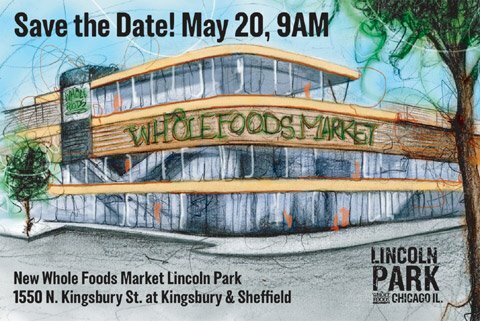 Whole Foods Market opened its jaw-dropping new Lincoln Park store on Wed., May 20, and I-GO was there for the ribbon-cutting ceremony with Mayor Daley and the Whole Foods Market brass. I-GO is one of WFM’s community partners, and the store has graciously provided us with a spectacular reserved parking space in its front lot. Needless to say, given both companies’ green missions, we put a Prius there. The new store is insane — and we mean that in the best possible way. Huge, yes. The third biggest WFM store worldwide. But that’s not what’s impressive. Sushi bar, wine and cheese tasting bar, a healthy grill bar, a spacious bodycare and wellness area, rows and rows of reusable earth-friendly shopping bags…and a whole halibut in the seafood section that was so ginormous we thought it might wriggle free of its display case and jump in the Chicago River, which runs right past the store. One of our fave features: an automated, temperature-controlled wine machine by a California-based vendor called Napa Technology that serves different sized pours in cups. This ain’t your grandparents’ supermarket, that’s for sure. The I-GO parking location here couldn’t be more fitting. We now have cars at five WFM stores, and besides the fact that we’re both eco-oriented and support local community initiatives, it’s important to note that grocery shopping remains the number-one reason people use I-GO cars. That’s synergy you can bottle and serve again and again and again. 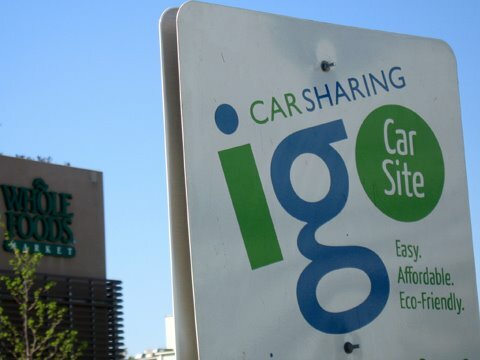 I-GO has the only car-sharing vehicle at the new Whole Foods opening tomorrow at 1550 N. Kingsbury. Appropriately enough, it’s a Prius. I-GO is a community partner of Whole Foods, and that’s appropriate in more ways than one: Grocery shopping is the number one reason our members use I-GO cars, and both companies are eco-conscious and care about supporting local communities. Ribbon cutting is at 9am. Stop by and check it out. The new store is impressive: the third largest Whole Foods in the world.